I haven’t updated in a while, I guess winter causing us to be perpetually ill doesn’t help. 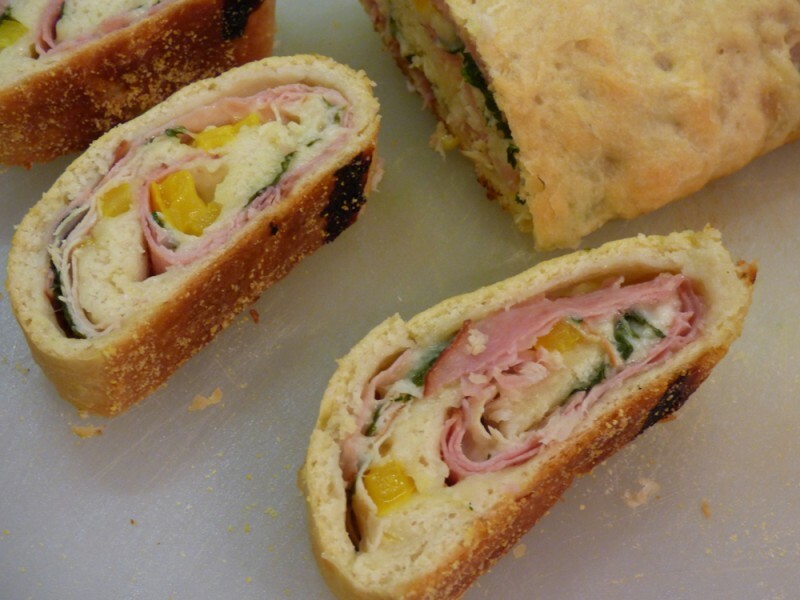 I’ve always wanted to make a stromboli! It just sounds awesome. 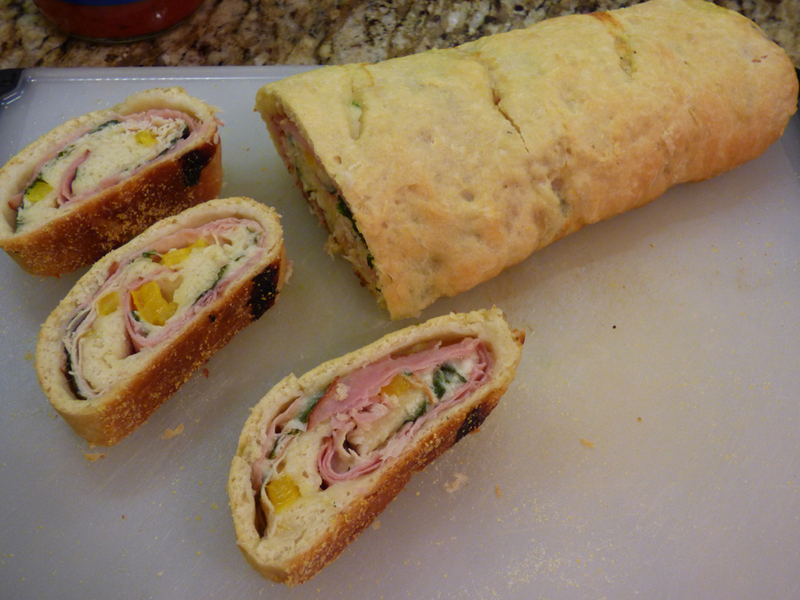 I finally got around to it and make a simple stromboli recipe from Better Homes and Gardens. It was perfect. We made our own quick pizza dough from scratch, but you can buy a refrigerated dough if you like. We will definitely make this again and substitute other ingredients like pancetta, salami, and other meats and veggies! Preheat oven to 375 F. Lightly brush a baking sheet with olive oil and sprinkle with cornmeal; set aside. 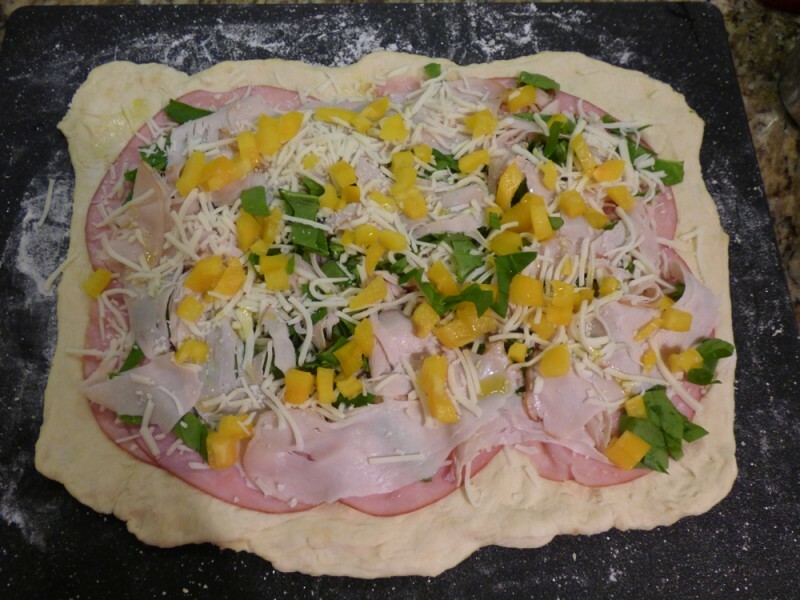 On a lightly floured surface carefully stretch or roll pizza dough into a 13×10″ rectangle. Arrange ham slices on dough about 1/2″ from edges. Layer spinach and turkey on cheese. Top with remaining cheeses, olives, and sweet peppers. Roll up dough, starting from a long side. Pinch dough to seal the seam and ends. Place loaf, seam side down, on prepared baking sheet. Brush with egg or vegetable oil. Using a sharp knife, cut slits in top for steam to escape. Bake about 30 mins. or until golden brown. Let stand for 10 minutes. To serve, slice loaf into serving size pieces. d.) I divided it into 12 servings and each serving was 4 Weight Watchers Plus Points so it’s very DOABLE! I don’t even feel like cheating and going back for another, one is enough! So there’s the justification! The recipe says it can make 24 small brownies, but we’re talking sub-toddler small in size and that doesn’t work for me. Maybe it works for a mouse. It makes 12 sizable brownies that you’d actually want to eat – about 3 1/2″ by 1 3/4″. In a large bowl, combine pumpkin puree, eggs, and oil until smooth. Set aside. In a separate medium bowl, mix together the flour, baking powder, spices, salt, and brown sugar. Bake for 15-20 minutes or until passes toothpick test. Cool completely before cutting (If you can wait, I couldn’t). 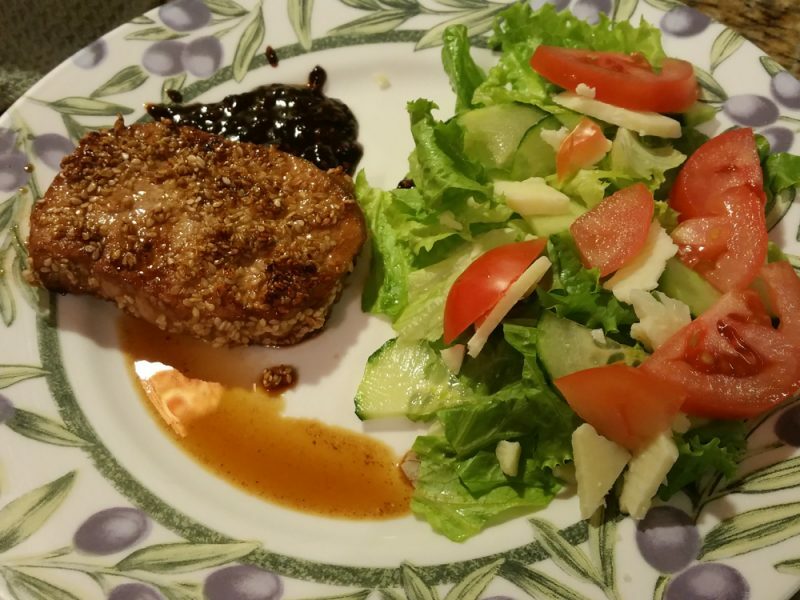 This is Rachael Ray’s easy and quick recipe for sesame pork chops. I am extremely picky with pork and I don’t know why. I could try ten pork recipes and there may be only one I’d like to make again! 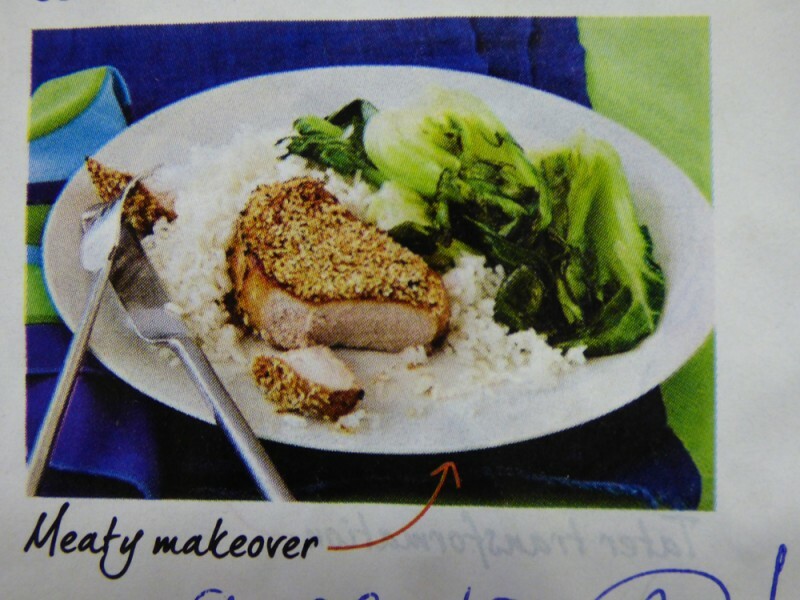 So, the fact that this recipe is acceptable to me, is quite shocking. 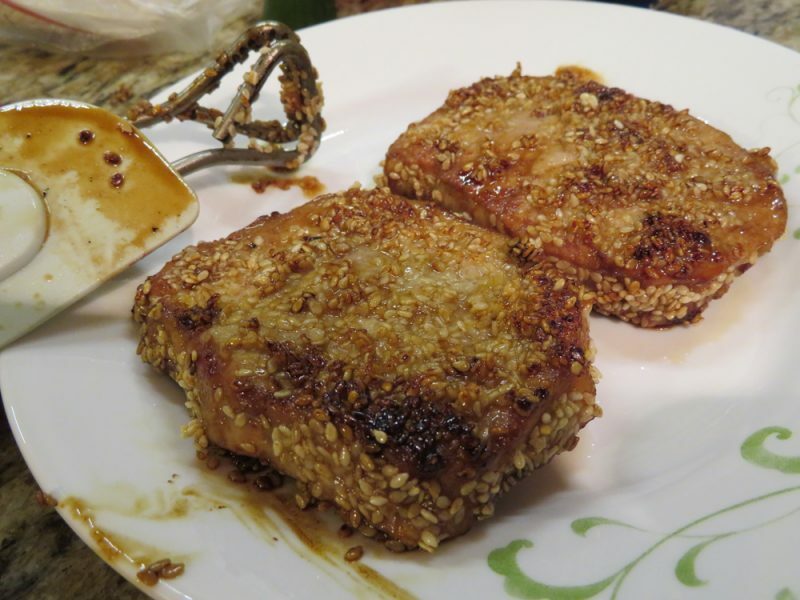 This is a meal that could be a staple with fresh or frozen boneless pork chops, as most people have the other ingredients in their pantry or fridge all the time. P.S. buy your sesame seeds in bulk at a discount grocery store. 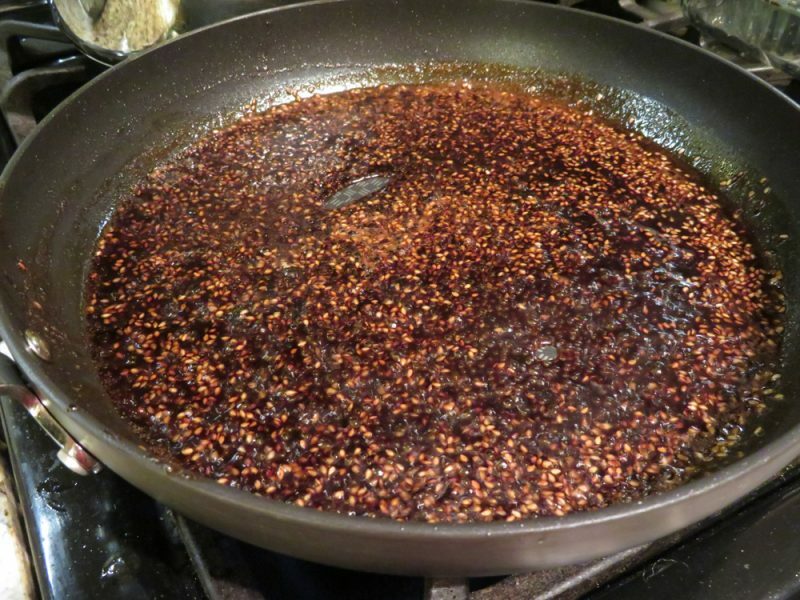 Don’t use your tiny McCormick container for this recipe because you need a half cup of sesame seeds. You’ll go broke, LOL. In a resealable bag, mix soy sauce, sugar, and vinegar. 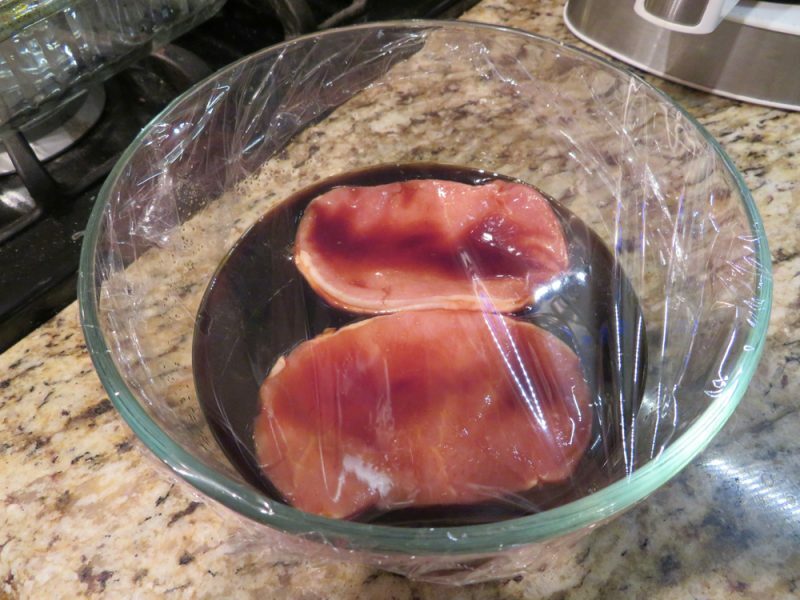 Add pork, cover with plastic wrap, marinate 20 minutes in fridge. In skillet, heat 1 T. oil over med-high heat. Check for doneness with a digital thermometer. Lightly tent the meat and let it rest before serving. I removed the meat from the pan. I took the leftover marinade and poured it into the same pan. Then I took a small glass of water (2-3 tablespoons) and added 1-2 tsp. of flour or cornstarch, mix that thoroughly. Then add that cornstarch water or flour water to your sizzling marinade in your pan. 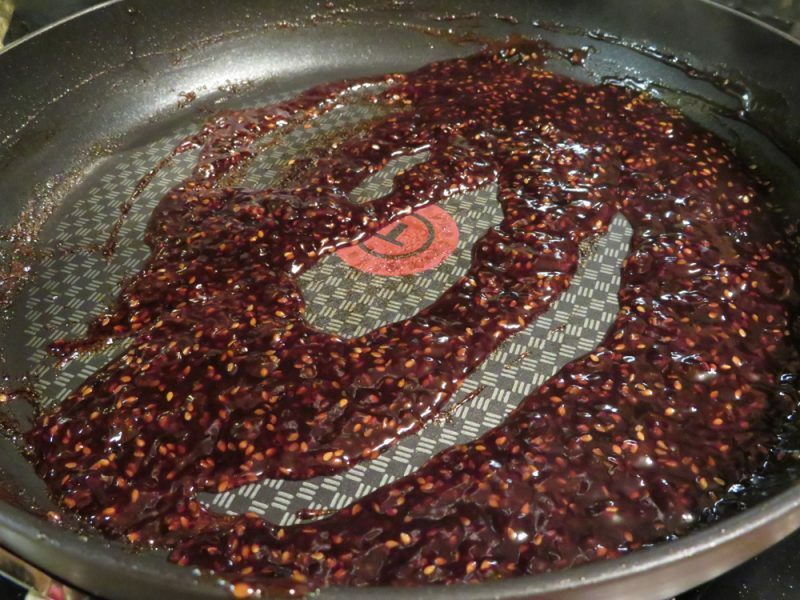 Simmer a few minutes and your marinade will thicken into a delectable sauce. I found this recipe in a Weight Watchers cookbook (Best of WW Magazine, (c) 2002) and gave it a try. It has a wonderful, savory flavor! I only had 1/2 cup of white wine left so I filled the rest of the cup with water to make 1 cup. 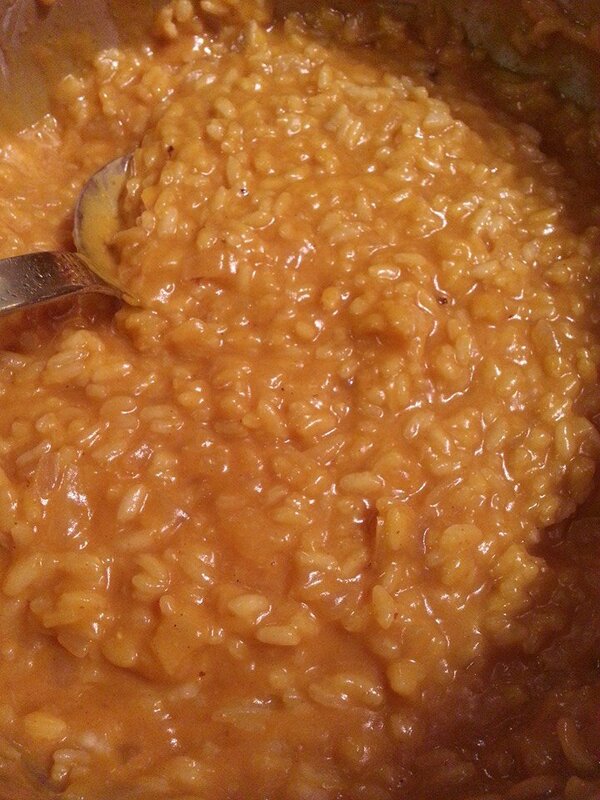 Don’t start this risotto recipe unless you have at minimum 20-30 minutes to stir at the stove! (The cookbook says it makes 4 servings: A serving equals 1 1/4 cups, which equals 8 pts.) This was too large of a serving so we did heaping 1/2 cup servings for 4 pts. 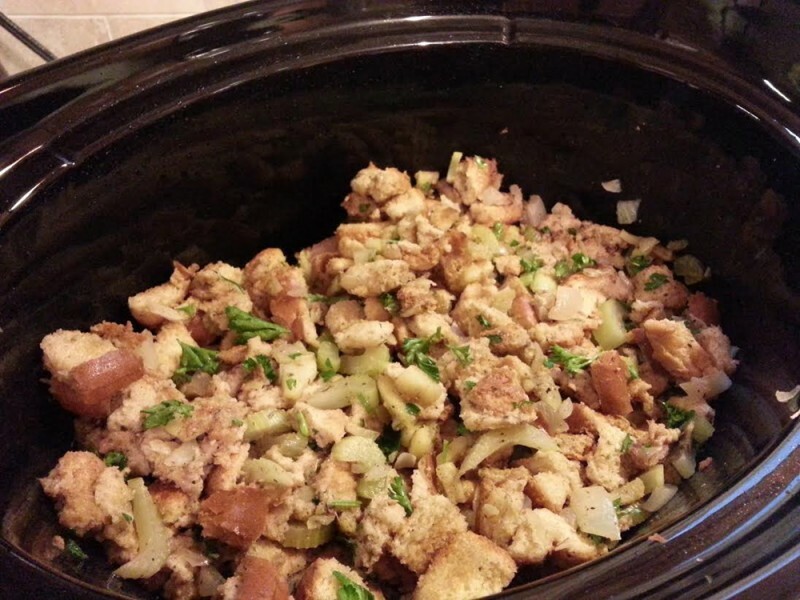 Update: This recipe definitely makes 8+ servings, so halve it if you’re serving less people. Bring the broth to a boil in a saucepan. Reduce the heat and keep at a simmer. Heat a large saucepan over medium-high heat. Swirl in the oil, then add the onions and garlic. Cook until softened. Add the rice and cook, stirring, until the outer shell is translucent, about 1-2 minutes. Stir in the pumpkin, cheese, brown sugar, cinnamon, salt, and pepper; heat through. Sprinkle with the nutmeg and serve at once. 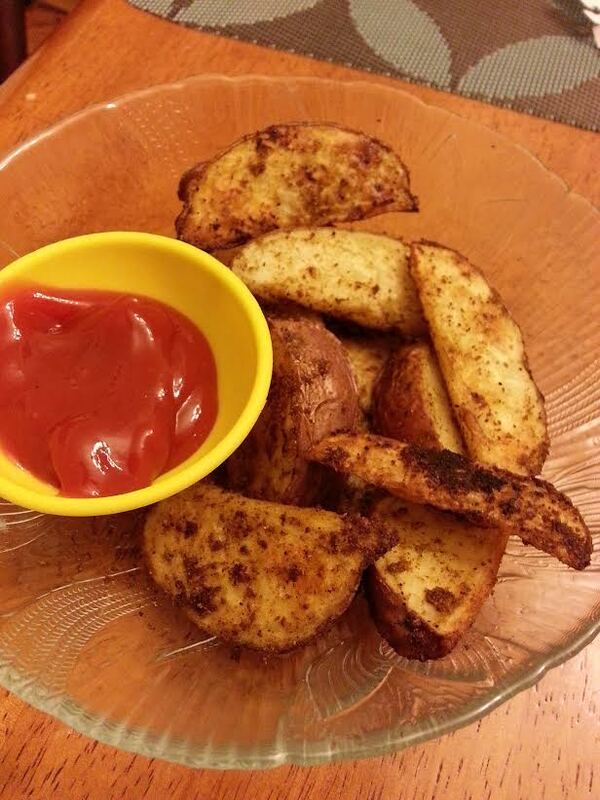 This is a simple recipe that gives your baked fries a lot of flavor! 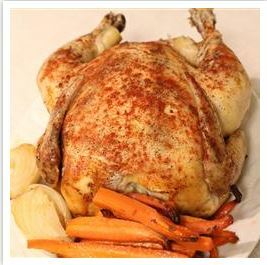 We really liked it, but it was on the hot side as the recipe is written. I would definitely omit the cayenne next time, personally. Very tasty! Preheat the oven to 450 degrees. 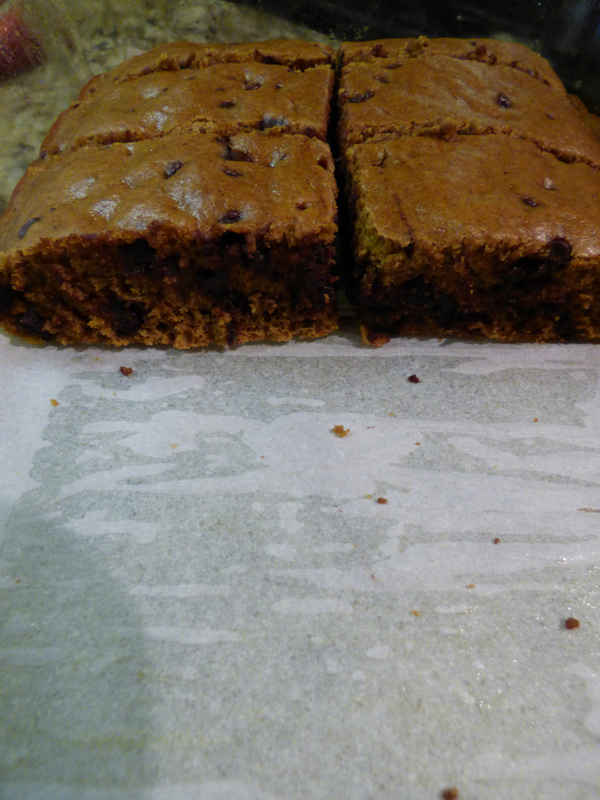 Lightly spray a jelly roll pan with nonstick spray. Combine the cut potatoes and olive oil in one bowl. Combine the cumin, garlic powder, paprika, salt, cayenne, and cinnamon in another bowl. Sprinkle the spice mixture over the potatoes and toss well. Arrange the potatoes in a single layer on the pan. Bake 20 mins, then turn the potatoes, and bake until crisp and cooked through, 8-10 mins. longer.